The editorial board of Detektor International magazine has confirmed the candidates for the 2010 edition of Detektor International Awards, following a thorough evaluation of what the security market has had to offer in terms of new innovative products for the last 12 months. - Aperio E100DS, a wireless door reader from Assa. - Omnikey 2061, a bluetooth reader from HID. - iLoq Privos, a locking solution for residential and small-commercial use from iLoq. - D-station, an access control solution incorporating dual finger access and face recognition from Suprema. - DALM 5000, an IP-based alarm dialer used as an external dialer from Dualtech. - CommPact, a small wireless residential/small commercial security and control solution from Electronics Line 3000. - Radar, an electromagnetic wave system for perimeter protection from GPS Standard. - AIM100, an intrusion infrasound acoustic-sensing detector from iDTEQ. - AV8365, an 8 megapixel 360 degree panoramic network camera from Arecont Vision. - Control Center 4.6, an open network video management software for HD-devices by Avigilon. - Q1910-E, a thermal network camera from Axis Communications. - Coldstore, a digital surveillance storage system from Veracity. The criteria to be nominated for a Detektor International Award encompass not only the technical solution but also the packaging and overall presentation of the product, which actually might just as well be a service. 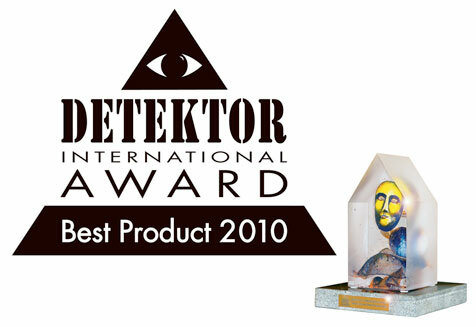 The Detektor International Awards should be viewed as a focus on continual technical development, and just as importantly they should envelope the continual progress of the demand for more sophisticated packaging qualities, where the presentation of the whole concept becomes increasingly more of a priority to successfully reach the customer, says Lennart Alexandrie, editor-in-chief of Detektor International as well as Managing Director of the Publishing House AR Media International, which also produces several other media products for the security market, such as SecurtiyWorldHotel.com. The Awards-final will be held at a dinner banquet held during the Skydd-exhibition in Stockholm, Sweden on the evening of the 15th of September. Around 900 guests are expected to attend this high-class event, a significant number not only from a Swedish or Nordic perspective. The winners in the different categories will receive custom-designed glass sculptures from the world renowned glass sculptor Bertil Vallien.